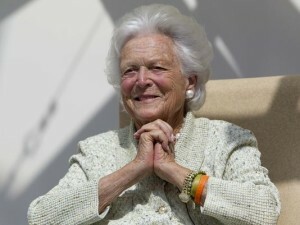 Former first lady Barbara Bush. “I think this is a great American country, great country, and if we can’t find more than two or three families to run for high office, that’s silly, because there are great governors and great eligible people to run. And I think the Kennedys, Clintons, Bushes there’s just more families than that.” Former first lady Barbara Bush, wife of the 41st president George H.W. Bush and mother to the 43rd president George W. Bush, in an interview on C-Span discussing the possibility of her son Jeb, former governor of Florida, running for president.